Flight To Success: I Am Awesome! And so is this children's book! Written by yours truly, and illustrated by my middle daughter, Kayla. This work has been in the making for a couple years, now. But time has been flying with so many projects. However, the time is now and we are getting closer for this book to be flying off shelves everywhere. Last night Kayla sent me the artwork of all 26 kids in a variety of careers. 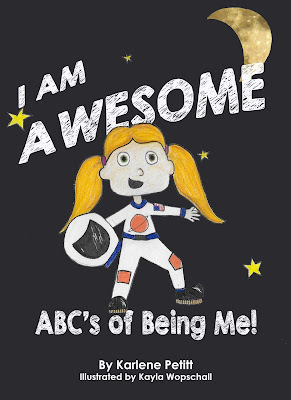 From an Astronaut to a Pilot, Engineer, or Chemist, children worldwide will be Awesome, Passionate, Exciting, and Cool. This book will inspire, and enthuse children everywhere. You will love this book! And so will the kids. I wish it were available for this Christmas, but the debut is planned for the January 23rd, 2016 in Bend Oregon at a fundraiser for Children's Museum of Central Oregon. My hubby and I will both be there, and anyone in the area would like to join as a guest or support we would love the assistance. I can be anything, because I am me! Fantastic idea. To motivate the next generation is the future for all of us. Such a tough world but made tough by ourselves. We all have a choice in life with the foundation being embedded by good parenting. We can all be inspired by having open mind's,to always be a learner,to learn from mistakes, and listen to other's. Being a child has its difficulties but only because we allow it to be. If you can read a book or in deed read to other's then it may just have an influence on us all. I'm not a big reader but I have recently enjoyed one or two book's. Reading someone else's life experiences for example has just changed one or two habits I had fault with. I may need to repeat the same books because sometimes old habits dye hard. Great concept great idea. If one child has a positive interaction with this book then success had been made. James, Thank you so much for your comment! Yes, motivating and inspiring the children of the world is so important! Thank you very much for your comment. Happy Christmas to you!!! Wow, you just keep cranking out new and amazing products. Love the kids book. What a great idea. Wishing you and your family a great Holidays. Thank you so much Rob!!! Merry Christmas and warm hugs to you and your family this holiday season!